January 2017. It was a chilly morning, sweatshirts were on, Bibles in hand, and excitement on our hearts. We had our first 4 kids coming in that day! We finally opened our doors after a solid year of remodeling and construction. A lot still needed to be done, but we were ready to serve our community’s kids. I had my very first girl that day. I was so excited to finally mentor a girl, a teenage girl, a girl searching for hope! Finally, the time came and the nerves hit, so I immediately went into prayer. Lord Jesus, help me to follow your lead and direction. I am utterly dependent on You, and I surrender this session to you. Help me to display Your perfect hope… The front door opened. There she was! The first girl the good Lord gave me. She walked through the door, and I introduced myself. As I explained our program, all she did was chew on her gum, cross her arms, and roll her eyes. Actually, her eye roll was so practiced, she could grow up to be a professional eye-roller. My heart sank. It seemed that his girl wasn’t searching for hope. The session went on, and there was no interest, no effort, and a whole lot of eye-rolling. We toured the Ranch, but everything was below her standard… I was below her standard. It was the longest hour-and-a-half of my life. Toward the end of our session, I asked what she wanted to do while she was here. “Um, I guess arts and crafts. I don’t like horses.” We finally made it back to the front, and no one could have walked out faster than she did. I was at a loss and close to tears. My first session with my very first girl seemed to be an absolute failure. Lord, I don’t know what to do. What I did know for certain, was that this girl had a really big wall, a really big ego, and a really big story. I knew I had to display a really big love for her. A Christ-centered love. How though? The next two weeks flew by. Those two weeks were filled with prayer, brainstorming, and more prayer. Crafting? How am I going to love this girl through crafting? I coordinate the crafting program, but I hadn’t had the obstacle of reaching out to a kid through it yet. Especially a kid like this. Lacey, another volunteer at the Ranch, was my partner for this girl. We talked, prayed, and brainstormed together, but all we could come up with was mediocre craft ideas. We finally got a session plan written down, but it just didn’t seem right. “Get her out of her comfort zone,” …God abruptly and clearly whispered in the depths of my soul. A brilliant idea that could have only come from God Himself entered my head. Aha! I knew exactly what to do with her. Thank you, Jesus! I rushed around to re-plan my session, and I informed Lacey on the changes. Excitement filled our hearts again! “Okay,” She replied in a monotonal, uninterested voice. The tone of her reply made me even more excited. Lord, she has no idea what she is doing today! Please break those walls down for us. Surprise her, excite her, give her laughter. We walk out of the craft room balancing the paints and very large brushes, and we start heading out back. I noticed confusion brush across her face, but it quickly vanished, and her indifferent stature returned. 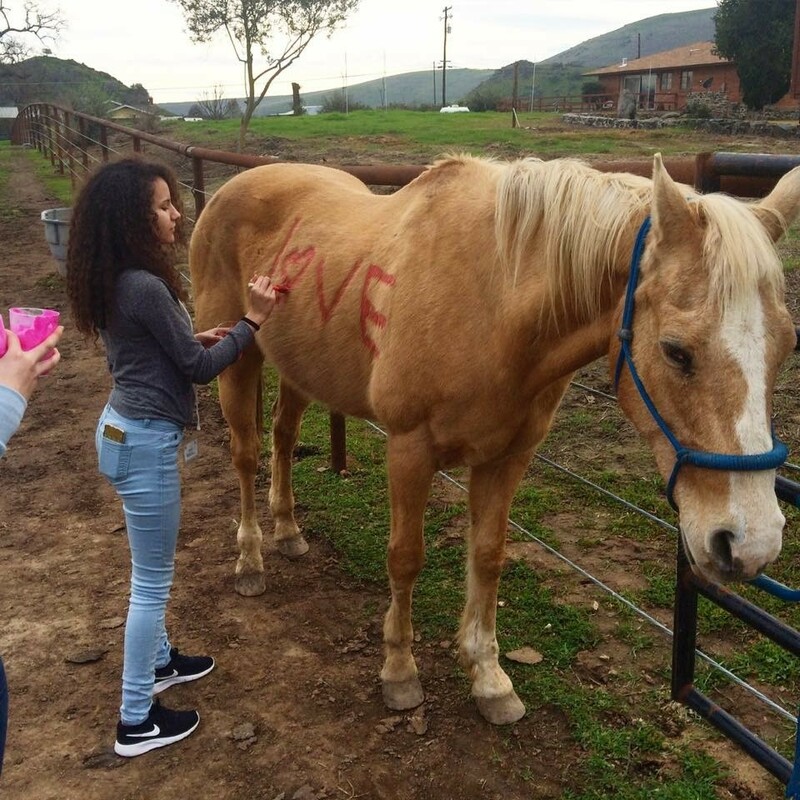 We were almost there, and before we turned the corner, I said, “Oh, by the way, you’ll be painting on one of our horses for Valentine’s day.” (I am so glad I didn’t miss her next expression, because it was truly priceless.) She clearly displayed a mix of shock, confusion, and excited curiosity. “No, silly! It’s water-based paint. Have you ever painted a horse before?” I asked. “No, of course not! But… But, wait…” She was at a loss for words. We got to Amarillo – he was tied to one of our fences. She stopped in her tracks and paused. “Start painting, girl!” I said. “What do I paint?” she exclaimed. “Well, you could start out with a few hearts. It is close Valentine’s day and all.” I replied. She dipped her brush in pink paint and slowly reached out to Amarillo’s side. She applied a few inches of paint, then Amarillo shifted his weight. She laughed. She laughed! Thank you, Jesus. She continued to paint, laugh, and she started asking questions about horses. Her walls, ego, and attitude came crashing down. Getting her out of her comfort zone, while still “crafting,” was exactly what God knew she needed. We asked her questions and she talked about her life. It was sad, but beautiful. Conversationally, we were able to speak of our relationship with Jesus, relating to Valentine’s day. God not only took her out of her comfort zone, but he took me out of mine, too. We are here, at Crown Valley Youth Ranch, to live and speak about the Word of life. It has appeared to us, we testify to it, and we proclaim it. Our joy is made complete when the God of the Universe uses us to reach out to His people. It is a humbling, yet marvelous truth, that may take place while painting a horse!